Paytm has announced a new feature that will allow users to send money to contacts directly via the phone book. However, the feature currently only available for Android users. 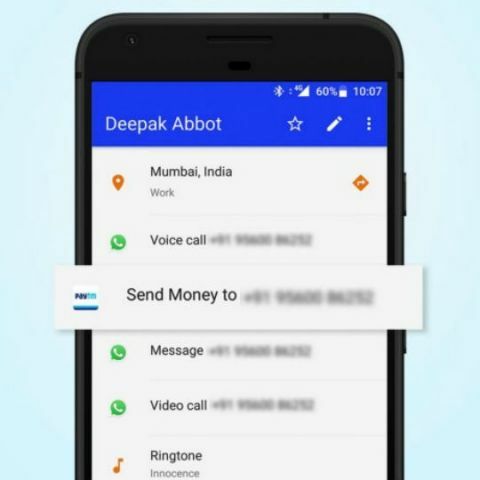 To use the feature, users need to open the Phonebook on their device, and select the contact that they wish to send money too. They will then see a ‘Send Money’ option, tapping on which will allow them to choose the amount of money they wish to send. A few days ago, it was reported that Paytm was planning to launch its own messaging service by the end of the month. It was noted that the new service would allow users to send audio, video, pictures and texts. The service would most likely also allow the transfer of money via Paytm’s own services. However, it might face stiff competition from WhatsApp, which is not only one of the most popular messaging services in India, but is also tipped to integrate the Indian government's Unified Payments Interface (UPI) into its platform. It was noted that the service may already be in talks with the State Bank of India (SBI) and the National Payments Corporation of India (NPCI). Other companies such as Uber, Amazon and Google may soon adopt UPI too. As per reports, Uber is planning to integrate UPI via the BHIM app, while Amazon is discussing the launch of UPI with a few banks. Google is tipped to integrate UPI in the coming months. How do I transfer contacts from a Android to Windows Phone?